The Bloubergstrand Area is situated on the west coast of South Africa, directly north of Cape Town. Although there is a small suburb by the same name, it is generally accepted as being an area which encompasses a number of smaller suburbs. Included in this area are the following, starting in the north and working south (closest to Cape Town): Big Bay, Bloubergstrand, West Beach, Sunningdale, Blouberg Rise, Bloubergrant, Parklands, West Riding, Table View, Sunridge, Killarney Gardens, Richwood, and Flamingo Vlei. Bloubergstrand is a unique coastal area for visitors to the Cape. The suburb offers all of the conveniences of urban living with restaurants to suit every taste along the coastline. Even the shopping centres in Bloubergstrand have sea views, where shoppers have easy access to national chain stores and stylish boutiques alike. With cinemas, golf courses and nightlife spots within such close proximity, visitors are never short of entertainment. Bloubergstrand is situated on the West Coast Road for easy access to a multitude of tourist attractions. A 20 minute drive up the Bloubergstrand coast will take visitors to sleepy fishing villages set against vast stretches of isolated beaches, while a 20 minute drive towards Table Mountain leads to the city centre and Southern Suburbs. The first of the Northern Suburbs is just 15 minutes away from Bloubergstrand where guests can visit some world renowned wine estates which are dotted between the Durbanville Hills and Stellenbosch and Franschoek mountains. For those on business rather than pleasure, the Cape Town International Convention Centre is a mere 20 minutes away. The Southern Suburbs, also a short drive from Bloubergstrand, are known for their beautiful forests and are home to the Kirstenbosch National Botanical Gardens, which attract both locals and tourists, especially during summer months when visitors to the gardens can enjoy sunset concerts by top local artists. Nature lovers can enjoy walks amongst the Fynbos Gardens, especially as the Western Cape is the only region in the world to have an entire floral kingdom unique to the region. Bloubergstrand Beach is situated between Big Bay and Table View Beach. The corner of the beach has some great rock pools to explore. Many photographs are taken of Table Mountain from here, with the waves splashing over the rocks and the mountain in the background. From the beach you can look out into Table Bay as well as look back down the beach at Table View and Milnerton. When the beach is windy, the surf is dominated by the tricks and aerobatic skills of kites surfers and boardsailors. The conditions here are ideal for these sports as its often quite windy and there is plenty of space along the beach to accommodate all the sailors. When the wind is calm this is a great place to relax and work on your tan. 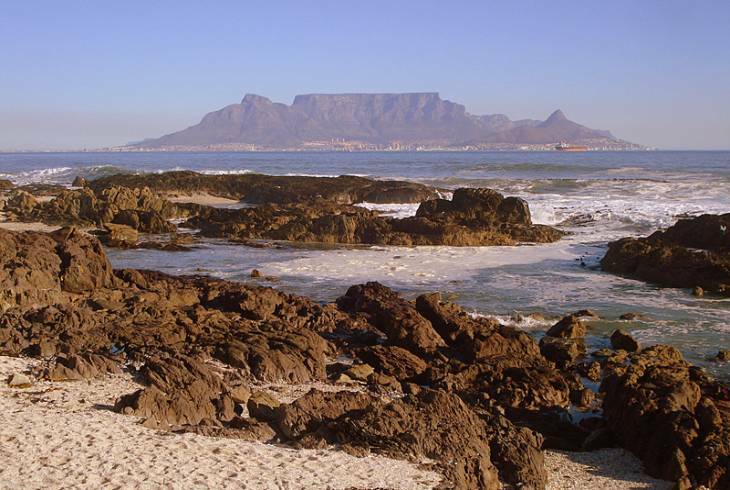 Climate: The Bloubergstrand area has a Mediterranean climate. Cape Town summers bring hot weather and can be quite windy, and winters are usually cold and wet. In Cape Town the summer months are November to March with December to February being the hottest. Winter months are from June to August. Bloubergstrand Area overview. Bloubergstrand Area Accommodation and Information.